Sky Lofts is one of the most popular new communities on the west side of Atlanta. The entire community is gated, has various amenities onsite, and provides effortless parking. Sky Lofts Atlanta is a loft community in the Castleberry Hill neighborhood. These one, two and three bedroom homes feature stainless steel appliances, ceramic tile bathrooms, hardwood floors with sound control, and a washer and dryer standard in each unit. Residents are also provided secure, controlled access entry, underground and surface parking, a swimming pool, business center, and fitness center! The area is going through considerable developments designed to improve the quality of life with added trees, sidewalks and commercial space. Have any comments or questions about Sky Lofts? Ask your question and/or share your thoughts about this Building. Looking to buy a two bedroom and two bath condo are rent one asap. 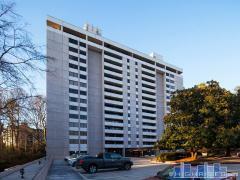 I am interested in a 2 bedroom, 2 bath condo. However, I have been looking online for a picture of a model, but I do not see one. Also, what is the association fee per month? Is there security on the property to help prevent car breakins? Is this available for rent?